FAQ: How Does Recorded Signed For Work With PC2Paper? How do I send Recorded Signed For mail from PC2Paper? After writing your letter in the normal way you can select the Recorded Delivery option from the extras drop down menu. How is my Recorded Signed For letter processed after I have sent it? Your letter will then be printed and posted in the usual way and then passed to Royal Mail for delivery. PC2Paper then receive a tracking number. Within 24 hours you should then receive an email from PC2Paper with your Royal Mail tracking number. You can use your tracking number at www.royalmail.com to check when your letter has been delivered and to see a copy of any signature that has been obtained on delivery. What happens if my letter cannot be delivered? If Royal Mail are unable to deliver your Recorded Signed For item and it remains unclaimed from the local delivery office it will be returned to the return address within 7 days with a reason why it could not be delivered. For this to happen the return address needs to a valid UK based address. Where no return address has been specified the letter is destroyed by Royal Mail. What happens if my return address is not in the UK? If you want to send a Recorded Signed For item and add a return address that is outside of the UK then it is not possible for Royal Mail to return the item outside of the UK. In this case the letter is destroyed. If you are outside the UK and want to use this option we recommend signing up for a PC2Paper mailbox which gives you a UK based address and using this as your return address. The letter will then be returned to us and we will notify you by email. What happens if my letter is lost? Royal Mail does not consider mail to be lost until 15 working days after it has been posted. If after this time your Recorded Signed For item has not been delivered you should contact PC2Paper giving the letter ID. We will then raise a claim for the lost item and providing that the letter was addressed correctly and the claim is successful we will then reimburse you for the cost of the lost letter. A new station has recently opened in Corby to provide a direct service into London for the first time in 43 years. Corby has not had a station since the 1990's and the new station has been eagerly awaited. The station has cost £17 million to build and should be running one train per hour into London, however due to a shortage of rolling stock there are not currently enough trains to operate the station to full capacity. This means that until more trains can be found there will only be one service per day from the new station. To run to full capacity the operator East Midlands Trains needs three trains but it currently only has one. It is hoping to have an hourly service up and running by April. 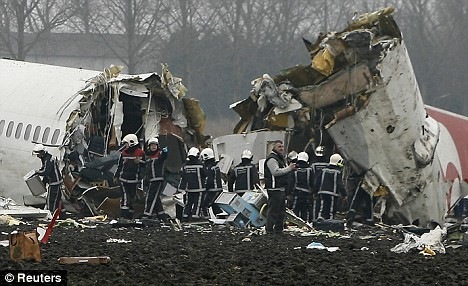 A plane carrying 135 passengers has crashed and broken into three pieces at an Amsterdam airport. The Turkish Airlines 737 broke into three pieces as it hit the ground near the runway as its attempted to land at Amsterdam's Schiphol airport this morning. Officials from the airline has initially said that no one had been killed but it later emerged that 9 people are dead and at least 50 are injured. As yet it is not known what caused the crash. You can upload images in the rich text editor by clicking the insert image button, browsing to the image on your computer and clicking the upload button, we should then be able to print your document complete with the images. Alternatively you can insert your images into a Word Document or PDF document and upload this instead. It's a sad day for those who like a bit of peace and quiet on their flight, as Ryanair start offering an in-flight mobile service. The service will initially be installed on 20 aircraft and will allow six people to make calls at a time. Calls will cost between £1.50 and £3 a minutes and text about 40p. The Chief Executive of Ryanair has dismissed suggestions that passengers who want a quiet flight might find the service annoying and if it is successful, the equipment could be fitted to the entire fleet within 18 months. Personally I would find this very annoying and this gives me a reason not to fly Ryanair. FAQ: What is Recorded Signed For? At PC2paper one of the options we offer in our extras menu is Royal Mail Recorded Signed For. We are often asked what this service is. Below we have given an overview of this service. Is Recorded Signed For Mail Guaranteed? It is a common misunderstanding that the Recorded Delivery option provides a guaranteed service, It doesn't. Recorded Delivery items are not processed any differently to normal 1st or 2nd class letters. How is Recorded Signed For Different to Regular mail? The difference is that with this service you receive a tracking number whereas 1st and 2nd class mail is not tracked. How Long Does Recorded Signed For Take? Royal Mail aim to deliver First Class Recorded item the next working day, or Second Class items within three days. How do I track my Recorded Signed For Item? You can use your tracking number to check the status of your mail online at www.royalmail.com and when a signature is obtained on delivery this is made available to for you view online. Tracking can take some time to be available online and this is often not available until the item has reached its destination. If a signature cannot be obtained and the item is not collected or redelivery rearranged within seven working days, it is returned to the sender where a return address has been specified. Can I Send Valuable Items Using this Service? As Recorded Signed For is not a guaranteed delivery service Royal Mail do not recommend sending valuable items using this service. Can I claim Compensation if My Item is Lost? Compensation is available with this service if an item is lost providing that it has been correctly addressed by the recipient. An item is not considered lost until 15 working days have passed. If after this time your Recorded Signed For item has still not be delivered then you can contact Royal Mail to make claim if you have proof of postage. Alternatively if you have sent the item via PC2Paper you can contact us directly and we will raise a claim for lost mail and issue a refund for the lost letter depending on whether the claim is successful. Blackpool Pleasure Beach has introduced an entry fee for the first time since it opened more than 100 years ago in 1896. Visitors will now have to pay either the £3 entry fee or purchase an unlimited ride wristband. The charges were brought in from the beginning of February 2009. British Airways has suffered its worst winter ever as more passengers choose to fly economy rather than pay for the more expensive business class or first class tickets. They are currently losing up to £3 million a day, that's about £20 million per week. BA has traditionally relied on its premium and much more lucrative business flyers who are the key to the their profitability. However, as recession hits it appears people are simply not prepared to pay for them. I wonder whether it might make sense for BA to reduce the cost of the business class service to a more affordable level in the hope that more people will be tempted to upgrade. I would certainly be happy to pay a little more for the extra room but think the prices for business class are currently over inflated. British Airways have said that they are considering a pay freeze for its staff. The new comes as the group reported a £70 million loss in the first nine months of the financial year. They are also looking at possible redundancies and have started talks with unions over pay and productivity. BA has warned that it expects to report a full year loss of around £150 million after taking into account the slump in Sterling. Two of the leading British holiday camp operators have announced thousands of new jobs in what could be a revival of the British holiday camp. The multi million pound investment comes as travel experts predict holiday makers will stay in Britain this summer because of the recession and the high value of the Euro. During the 1960's when British holiday camps were at their most popular they attracted around more than a million visitors a week. Pontin's have announced a £50 million investment in its six seaside holiday camps, this will include hiring 2,000 new staff over the new three years. Butlins will also invest £20 million in a new hotel at Bognor Regis and will also hire more staff for the summer. The moves come after they experienced a 15% increase in booking so far this year. At between £414 and £800 a family of four can enjoy a week's holiday in a family chalet during August. Passengers aboard a flight from Moscow stopped the flight over fears that the pilot was drunk. Shortly before take off the passengers were concerned by the pilots slurred comments and complained to flight attendants. Their concerns were ignored and airline staff threatened to expel the passengers for making trouble. As the situation spread Aeroflot representatives were called in to try and calm the passengers with one announcing it "not such a big deal". The pilot did nothing to allay the passengers fears when he appeared from the cockpit unsteady on his feet with bloodshot eyes and eventually the airline gave in to demands of the passengers and has the pilots replaced. The flight eventually took off three hours late but with a sober pilot at the controls. The pilot told the newspaper Komsomolskaya Pravda that he had been celebrating his 54th birthday with friends the night before the flight on December 28, but said that he not been drinking. This article suggests that choosing a window seat on a plane could be fatal. Research has shown that people sitting by the window face double the risk of deep vein thrombosis, a condition which can cause blot clots. The risk is even more pronounced for those passengers who are obese, they are six times more likely to develop a blockage if they choose a window seat. It is not clear why the risk is greater for passengers who choose a window seat but one theory is that passengers find it easier to fall asleep by a window and it is already known that sleeping for several hours at a time on a long flight raises the chance of a blot clot. It might also be that passengers near the window experience more cramped conditions that those who choose an aisle seat. Preventative methods such as drinking water were found to have little difference to the study. It's not all bad news, if you can afford to fly business class then you are 30 per cent less likely to develop the condition. Councils opposing Heathrow expansion have prepared a blueprint showing how the airport could also become a rail hub. The coalition of 22 local authorities have launched plans for a new rail network around the airport that could serve large areas of London and south east England. If it went ahead it would allow 40 trains an hours to pass through the airport, the equivalent of one train for every plane. The proposed rail network could offer connections to 150 stations within a 25 mile radius and has the potential to take 1 million cars of the road every year. Due to heavy snow in the South East of England some areas are experiencing delivery delays. During this time we will continue to send all letters but customers should be aware that in many areas deliveries have been suspended and that letters will take longer to arrive. Affected areas include parts of Kent, Surrey, Suffolk, Berkshire and Bedfordshire.